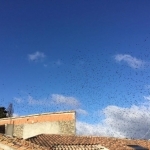 More than 40 years ago, thousands of starlings, (étourneaux) on their way to Africa chose Perpignan as their ideal stop-over holiday destination. 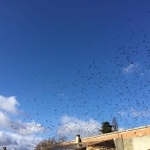 Food ‘à volonté’ of fruit, grapes, olives… mild climate, and well lit town with tree lined streets put our capital of Catalan culture at the very top of the starling ‘Must visit’ hit list. 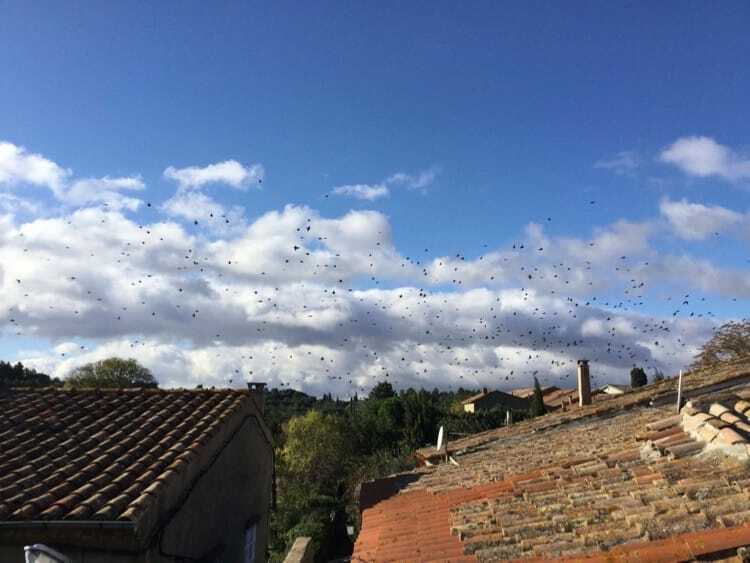 Over the years, these feathered tourists have doubled, tripled and quadrupled in number and most nights, around sunset, between mid-October and February, the skies of Perpignan are assailed by tens of thousands of small dark shadows, heralding the start of Autumn in Catalonia. 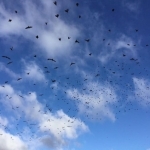 In a Hitchcockesque tableau, they settle and roost on tree and telephone line, plane tree and rooftop until morning when they swoop down on the fields and pillage seedlings, corn and crop. 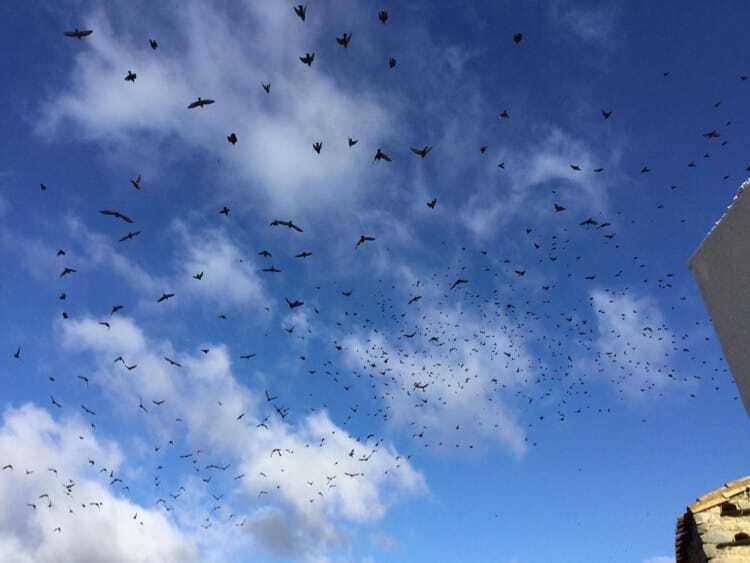 All sorts of methods have been deployed, unsuccessfully, to get rid of them, including loud speakers imitating their predators, eagles, fireworks, bright lights, cutting down of trees, and more recently a fake ‘starling town’ on the outskirts to tempt them out of the town centre. 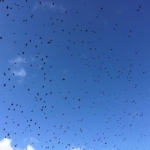 Did you know that a starling produces one gramme of poo per day, according to ornithologists? 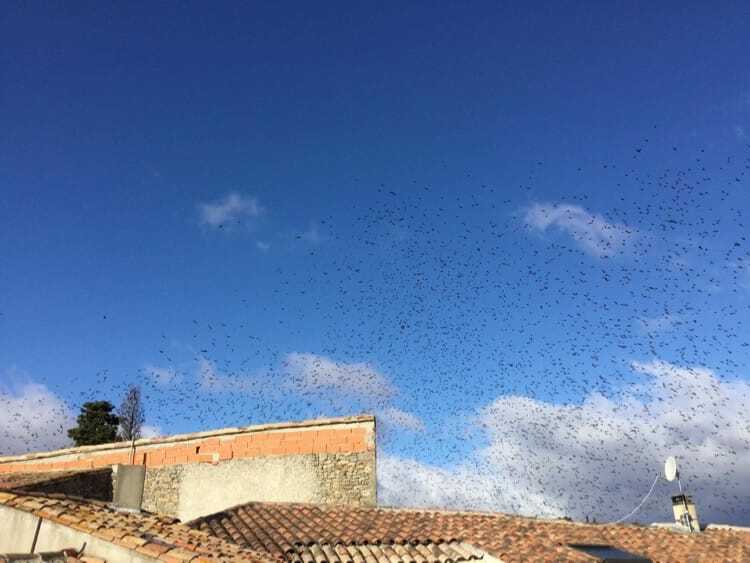 Times that by the hundreds of thousands of these cute little villains, and you might want to consider wearing a hat between mid-October and February, when the skies of Perpignan are darkened by startling starling clouds of chirps, warbles, trills and whistles… and poo-a-plenty! 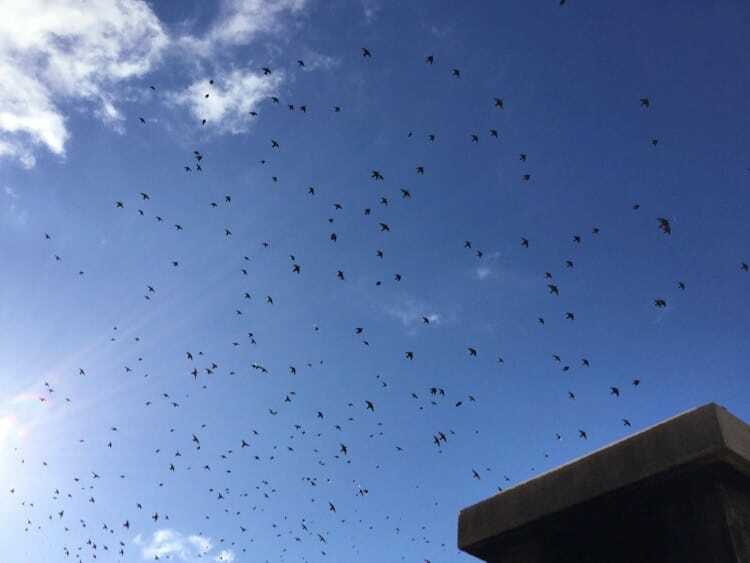 So each year, hundreds of trees in Perpignan, mainly plane trees much appreciated by the feathered menaces, are severely trimmed and reduced to allow less perching space, particularly on the boulevard des Pyrénées and the quai Nobel. 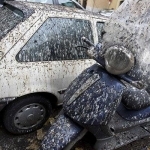 Every evening apart from the weekend, two vehicles equipped with rockets to frighten away the birds, pass through the streets followed by a street cleaner and a street washer spraying 1000 litres of water. 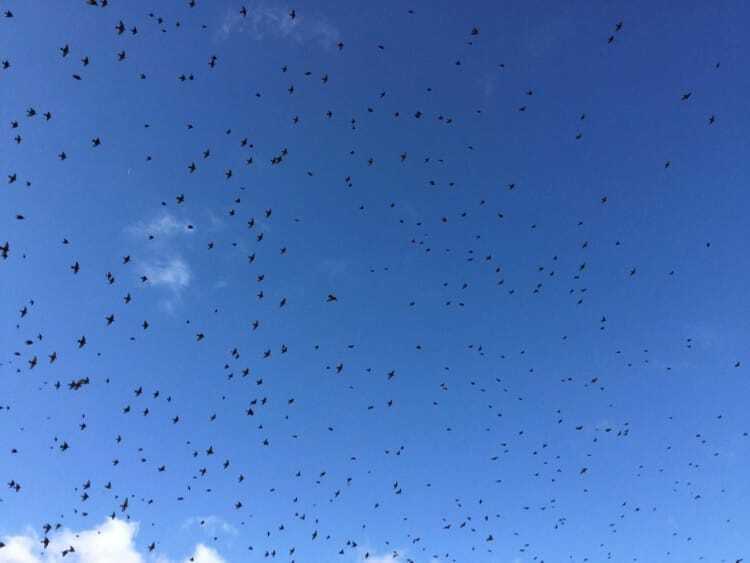 Agricultural menace, hygiene and health risk, (did you know that each starling produces one gramme of poo per day, according to ornithologists? 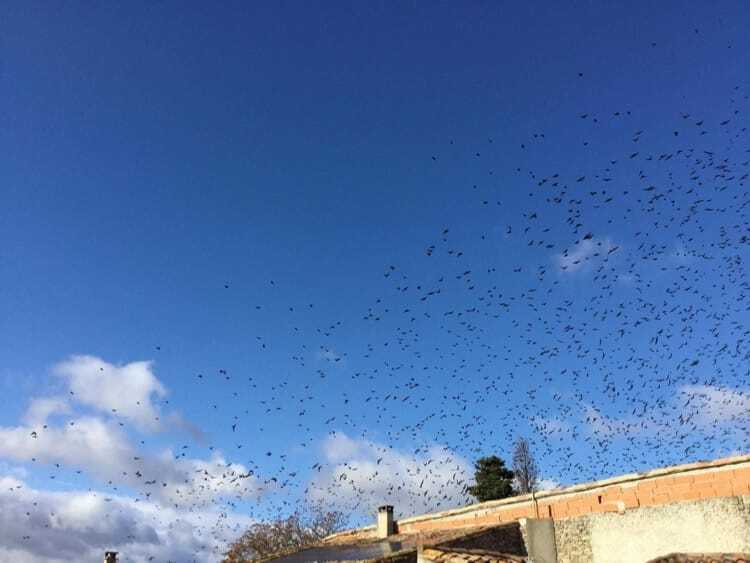 ), there is also the high risk of arriving in Perpignan a brunette,and returning home a blonde!! 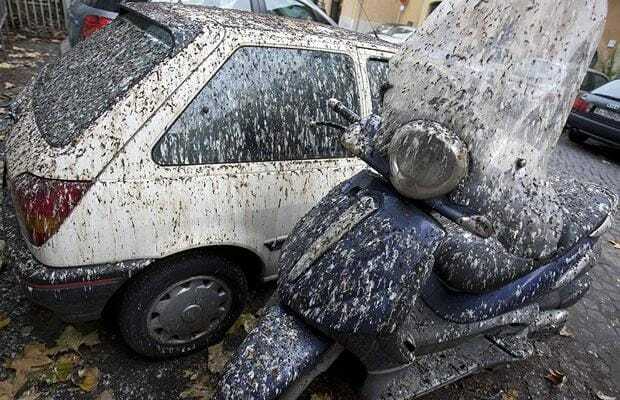 Be careful where you park your scooter! Comme tous les ans, une partie des platanes de la ville seront réduits. Cette année, ceux concernés par la problématique étourneaux sont (par ordre d’intervention) : Quai Batllo, Quai Sadi Carnot, HLM Dalbiez, Quai Vauban, Quai Lattre de Tassigny, Avenue du Lycée. Les travaux débuteront début novembre. 2 agents équipés de 2 véhicules et d’une arme du lundi au samedi inclus de 16h30 à 20h30, du 24 octobre courant au départ des étourneaux (estimé au 3 décembre). En cas d’une arrivée plus massive des étourneaux le dispositif passera à 4 agents (2 tireurs). Cette méthode étant la plus douce et la plus écologique, elle doit provoquer l’abandon du nichoir au terme de quelques années.